Much like the first two instalments, The King Of Fighters '96 gives you a diverse roster of 2D fighters to pick from as you assemble a team of three to punch, kick, throw and brag your way to victory. The third instalment in the series also sees the sprites of old discarded for an instantly familiar hand-drawn style, as well as folding in a series of much-welcomed gameplay tweaks. For a start, there's the removal of the sidestepping ability, replaced with a much more tactile and intuitive roll that can be used to avoid attacks. Initially designed to perform the same function as the old sidestep, it enables you to get close to an opponent (or put some distance between you), possibly opening the door for a sweet counter attack. 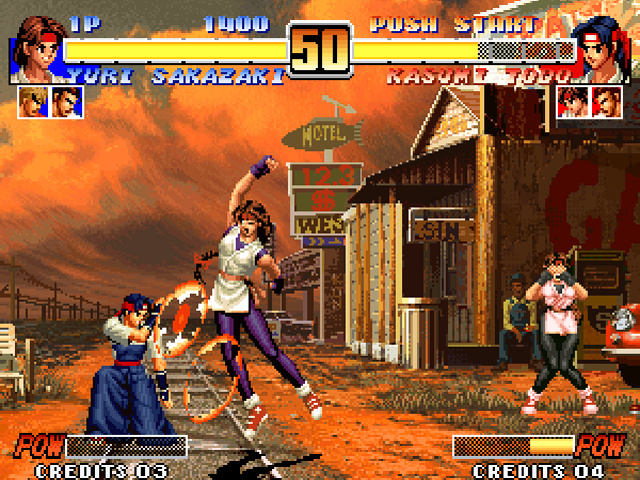 It's performed by simply pushing a direction with whatever buttons you've mapped for Neo Geo’s A and B, although for ease of use this particular button combo is mapped to Switch’s ZR button. Another change is the ability to run by double-tapping forwards, quickly closing the gap between fighters without the need for a risky jump. Jumping itself is also different this time around as it's affected by whether you go from a standing or running position. You can also pull off a slight jump animation by quickly tapping up (useful for faking out opponents and potentially gaining the upper hand). The rolls, jumping options and run ability make for fast, frantic fights and offer plenty of player agency during fights, adding significantly to the entertainment (particularly during two-player bouts). Character-wise, there are 27 fighters to pick from and the lineup is quite similar to that of the '95 edition, although that game’s boss characters (Saisyu Kusanagi, Omega Rugal) are gone, replaced with new final challengers Chizuru Kagura and Goenitz. As far as playable characters are concerned there are seven newcomers including the popular Leona, but four fighters (including Billy Kane) have been left out. Should you grab The King of Fighters '98 from the eShop you’ll find all but one of the '95 omissions included alongside a chunk of this game’s additions, but not all of them. Art Of Fighting 3’s Kasumi Todoh is in this game, but not '98 and more notably this game features a Boss Team absent from the Dream Match title. 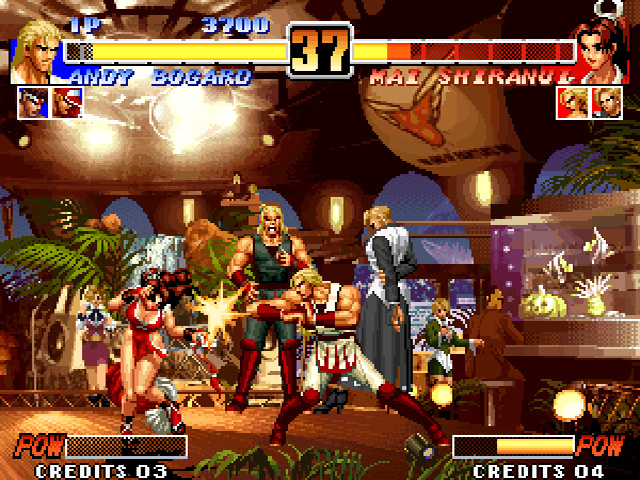 The appeal of this team is that it is headed up by the Fatal Fury series’ ultimate bad egg Geese Howard, joined by Fatal Fury 2’s Krauser and Art Of Fighting’s Mr Big. In addition to the regular arcade mode, the usual ACA Hi Score and Caravan modes are included, limiting you to one credit and five minutes respectively as you try to gain as many points as possible to move up the online leaderboards. It provides a slightly different way to play, but as with most fighters the modes aren't as appealing as with other genres. Other than team battles, you can still dive into the options menu and switch the arcade mode to a traditional one-on-one, best of three rounds fighter – although as with its predecessor, cutscenes/endings play out the same as if you had a full team. Story-wise this is the second part of the Orochi saga, offering up a few scenes to read through towards the end of the game. There’s some replayability in going through the game again too, as each of the set teams have their own endings in addition to the standard one you get from fielding a custom group. 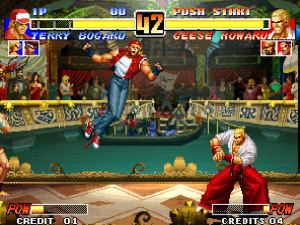 The King of Fighters '96 offers the usual enjoyable team battles with a good range of fighters to pick from. This particular entry introduces some nifty gameplay changes to the series. Of course, all of this and more would feature in the ultimately better The King of Fighters '98, but it's a confident entry in the series nonetheless. If you're interested in the ongoing story then The King of Fighters '96 is still a competent fighter, and there's plenty of entertainment to be had in its hand-drawn brawls. One of my favourite KoF, the sound track was amazing. Loved the Geese, Art of Fight and Chizuro songs. Getting this game for sure. Somebody forgot to mention this s one of the more graphically varied entries in the KoF series, background wise and more of life, even in comparison to 98 and onwards. WIll be last game I buy on ACA though. Will be downloading ROM version instead of buying as endorsed by Nintendolife in one of their articles. The boss team is the reason I got this game back in the old import days for the Sega Saturn. Having the privilege to play as Wolfgang Krauser from Fatal Fury, Mr. Big from Art of Fighting, and Geese Howard from both franchise all within the large KOF roster makes this the ultimate KOF experience. Definitely a day one buy for me on Switch. @YamAsereht Ha, I saw your comment on that article. What you might not realize is that you can legally buy NEOGEO ROMs on PC (along with SEGA Genesis/Mega Drive ROMs) that can be transferred to a flash cart. I have about 30 legal NEOGEO ROMs I can use anywhere because I bought a NEOGEO 25th HumbleBundle a few years ago. NintendoLife never mentioned or advocated piracy. @YamAsereht Oh shut up man and stop spouting the same crap on every article you comment on. @ONLYUSEmeFEET (nice KotM pic BTW), you know you make a good point, about about legal purchase of PC versions of Neo Geo version (even of only 30 games, for now). Can't say the same when linking fan translations and how-to guides on hacking though in articles though. You get a nice +1. @OorWullie - No I wont! Now Clean up that blue ink on the ground and stop sitting in the corner sulking. You are only upset, because Pikachu speaks the human language in the latest Pokemon movie. Rainy day purchase for me. @OorWullie It is weird right - what's with all the "ROM hack" comments @YamAsereht? Almost as dull as all that 60FPS b*llocks people whinge on about. Almost. 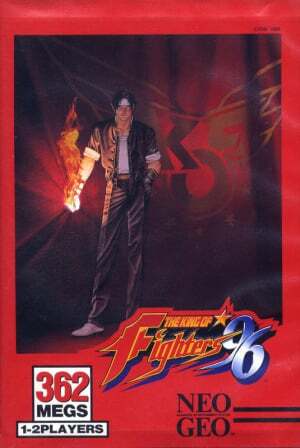 This was the first KOF game I imported from Japan on the Sega Saturn after getting hooked on the PAL version of KOF 95. Those were the days. Such a brilliant game. 96 and 98 are my favorite in the series. The next KOF game I want next on ACA is 02. KoF 97' is my favorite of the old skool series; the backgrounds are just too good, especially love the Bali level. My first KOF, my first Neo Geo game. And what a treat. BUT.... I bought the japanese PsOne version, which was almost as great as the Saturn one, and featured the fantastic remix musics from the Neo Geo CD version. And it's such a pity that we can't find this version anywhere today, even on a Raspberry Pi. I really regret that Hamster does not release the Neo Geo CD versions on Switch. I have this on my PSP - not sure if I’ll double dip like I did with ‘98.